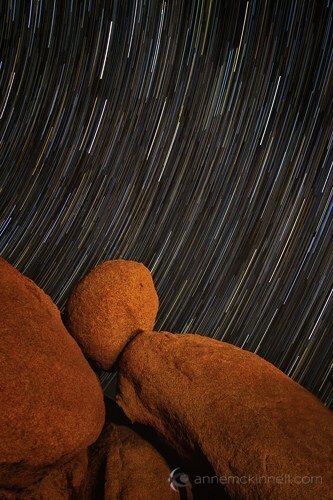 Photographing star trails can be challenging but also rewarding. If you’ve never tried it, these tips will help you get started. To make a striking photograph of the stars, there are a few requirements when it comes to choosing the right place and time. You must be far away from any city lights since any ambient light will make the stars less visible. If you live in a big city, this could mean traveling some distance. Recently I was in Nevada, about an hour’s drive away from Las Vegas, and I couldn’t believe the amount of light in the sky from the city. For the photograph to have a sense of place, you will need something interesting in the foreground. It must be something that doesn’t move like a mountain or a building. 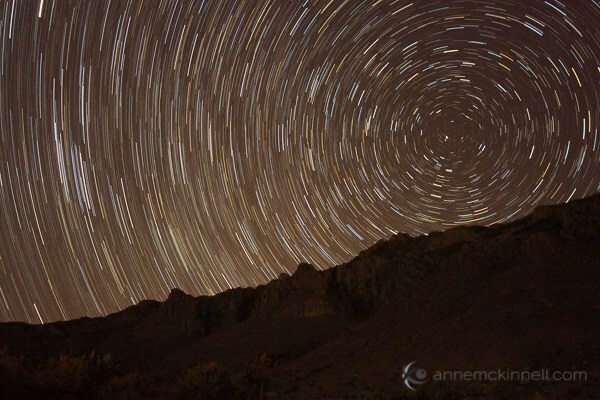 Plan your star photography adventure for a moonless night. Or at least the moon cannot be above the horizon while you are photographing. Similar to what happens with city lights, the stars are not as visible when the moon brightens the sky. It should also be a clear night with no clouds. Star trails at Cowichan Lake, British Columbia. The best way to go about making an image of star trails is to take multiple exposures and combine them in post-processing. While it is possible to take one very long exposure, often the heat coming from the sensor will cause hot spots in your final image. I usually use a 30-second shutter speed and make 60 images. The most important thing you will need is a tripod to stabilize your camera during the long exposures. A cable release or intervalometer is extremely handy but not essential. You can use the 2-second timer on your camera and manually click the shutter continuously for half an hour. It can be done. But, with a cable release you can set your camera to continuous shooting and lock the cable release and your camera will continue to make images until you unlock it. If you have an intervalometer, you can program it to take a specific number of images of a particular shutter speed. This is the easiest but most expensive way to go about it. Finally, make sure you have a fully charged battery since the cold night may cause your battery life to be shorter than usual. Once you are on location and the gear is ready to go, you can set up your composition. If possible, go one night ahead of time and locate Polaris, the north star, in the sky. If you can manage to get Polaris in the frame, all the stars will circle around it. 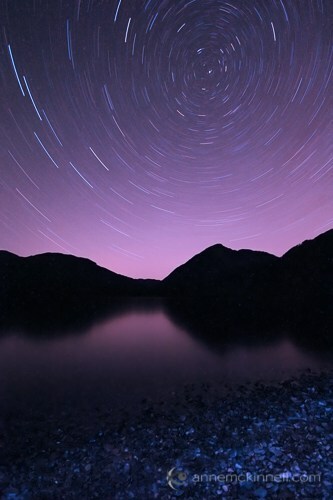 If Polaris is not in the frame, the stars will appear to travel in a semi-circle. If you can’t go a day ahead of time, use your compass and try to get as much sky in the frame as possible. I like to set up my composition during the day so I get just the right amount of foreground in the frame and set the focus so that the foreground is sharp. This is much easier to do during the day than it is once it is dark outside. Remember once you have set the correct focus to turn your auto-focus off so your camera does not attempt to re-focus at night. Also, your image stabilization should be off anytime your camera is on a tripod. When it’s dark and you are ready to begin, which will probably be a couple of hours after sunset at least, you can do some tests to make sure you are getting good exposures. You will want to use a large aperture (small F stop number) to ensure you have the greatest amount of light entering the camera as possible. If you try to use a smaller aperture, the star trails we are very dim. So, since you need a 30-second shutter speed and a small aperture, such as f/4, proper exposure will be determined by the ISO. Try taking a test shot at ISO1600 and see if you can see the stars in the image. If not, increase the ISO to 3200. Also, make sure you turn your in-camera noise reduction off because it will require an additional 30 seconds after you make your exposure to do the noise reduction and you will end up with little gaps in your trails. To combine your images, I recommend a free program I have been using called StarStaX which is easy to use and it does a great job. Just point StarStaX to the folder that contains all the exposures, selected “lighten” as the blend mode, and let it go to work. This can be the most exciting part of the whole experience since you finally get to see what you have created! Once you have the stacked image, you might find you have some UFO’s in it that look like straight lines crossing your curved star trails. Those can be caused by comets or airplanes. I usually use the healing brush in Photoshop to remove them. You might have to invest a bit of time in planning, making the exposures, and processing the images, but the final result will be well worth the investment. All you really need is a bit of patience. Anne McKinnell is a photographer, writer, and nomad. She lives in an RV and travels around North America photographing beautiful places and writing about travel, photography, and how changing your life is not as scary as it seems. 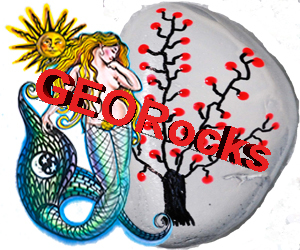 You can read about her adventures on her blog and be sure to check out her free photography eBooks.